New Numbers On Lost Gulf Oil: Could BP/Halliburton’s ‘Accident’ Be Their Victory In The Long Run? Posted on May 13, 2010 | Comments Off on New Numbers On Lost Gulf Oil: Could BP/Halliburton’s ‘Accident’ Be Their Victory In The Long Run? Yesterday, I asked readers of my blog [on Amplify.com] to consider a number: 210,000. That number supposedly represented the number of gallons that were spilling into the Gulf of Mexico each day, as obtained from the New York Times. Here’s a link to my Amp article. 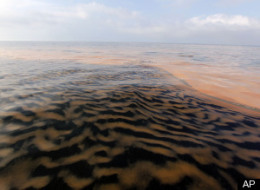 Today, however, NPR is reporting that nearly 70,000 barrels are gushing out every day. Here is a link to an article from Huffington Post discussing NPR’s report. By now, many of you have heard of the reckless, if not outright fraudulent, “workmanship” and “guarantees” that led to this environmental and economic catastrophe. If you have, then you also know that two international companies – BP and Halliburton – are front and center in this debacle. Both BP and Halliburton rely on oil interests – either directly or tangentially – to keep their profit margins afloat. This is true regardless of how many feel-good, huggy-feely, alternative energy commercials BP puts on television. Given BP and Halliburton’s reliance on oil interests, has it occurred to anyone that these two companies will actually benefit in the long run from this disaster through the simple application of the first rule of economics: The Law of Supply & Demand? If there are, in fact, 2.94 million gallons of oil lost in the Gulf each day, then at what point are we the consumers going to start subsidizing the screw up by these companies by paying more for gas at the pump? At what point do we start asking ourselves, was this accidental? At what point do we start actually giving a damn? Addendum – There is a guiding principle in Anglo-American law: One should not profit from his own wrongdoing. In California, this “common law” principle is codified by statute in our Civil Code at section 3517 [No one can take advantage of his own wrong]. What an absolute travesty and mockery it will be if these companies actually become richer as a result of their misconduct. This entry was posted in Environmental Issues and tagged BP, Gulf of Mexico, Halliburton, oil spill. Bookmark the permalink.